Hello hello~! 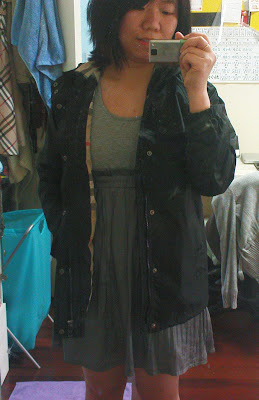 Burberry Dress & Burberry Trenchcoat! Meet Burberry Windbreaker~! Handsome or not? So rich?? buy another Burberry!?!? WTFMF@#$@#%! She saw my face glowing when I was trying it. I love the Burberry windbreaker! It's light! It's warm! and got a hoody!!! I love hoodies! Tell you a secret... it's actually a BOY size windbreaker. I tried on BOY's clothing because their cutting is slightly bigger than the girls hehe. But honestly, if i try on women's jackets, I look like a midget because Im so short compare to the people in Europe! So kids size is the way to go. Furthermore it's CUTE! Who cares rite hehehehe... So yea, I tried on 4 different kind of jackets and this one is the most versatile and it's the best looking jacket on me while others looks abit boyish. Anyway, thank you Frances for getting me such a useful present! I will wear it every day! DEFINATELY! Happy snapping away with my windbreaker. 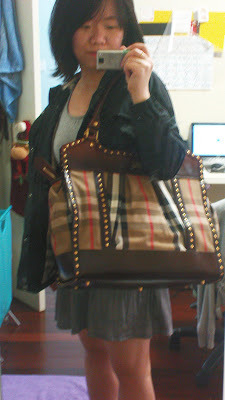 Of course I must take a photo of Frances' NEW limited edition Burberry bag! hehehe it's gorgeous and look really cool isn't it?